Such a rare opportunity to touch and drink from such a unique glass. I didn’t know that this kind of glass even existed, it’s not exactly what you find in Ikea or even more upmarket home interior stores. A completely handmade glass: blown by hand. Recently Jason had a mould custom made from a drinking glass that he created. He uses the mould to make the drinking glass creation process more streamlined and the products more easily reproducible. 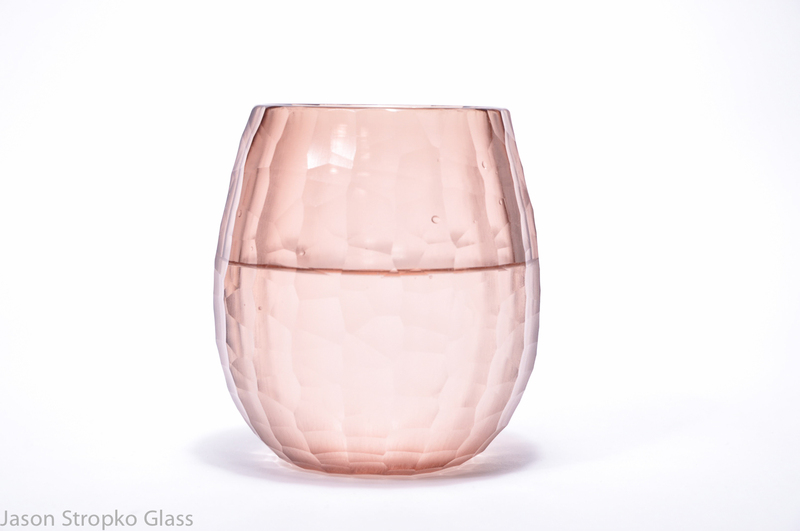 Each drinking glass is still finished by hand, this is not the same as a completely mould blown process where the tops are ‘popped’, instead this mould acts as the guide to the final shape, which then has room to vary slightly, giving the lovely handmade feeling. This particular drinking glass was blown very thick and sturdy to allow plenty of room to battuto it. What is battuto? It is effectively carving of the glass, or rather grinding it with a glass grinding disk against which the glass is pressed to grind each facet that you see. A single glass takes a good 90 minutes to battuto (this one actually took 2 hours!). But first it needs to be blown, for which it is really quite useful to have an assistant who can open and close the blow mould (it operates with a hinge and is tricky for the glassmaker to use alone unless he/she is an octopus).. After the glass is blown it enters the annealer, which is effectively a slow cooling down oven. The glass will idle in the annealer overnight on a long cooling cycle. This is essential or else the glass would be prone to cracking when it is knocked slightly, or it could just spontaneously combust, too. Nobody wants a combusting drinking glass, right? After the glass has cooled down it then goes through the battuto process after which it is hot torched to soften sharp edges. And this is where I am not sure if it will be annealed once more.. I just found this great link to A Murano website that explains Battuto better than I.